I have a lot of conflicted feelings about Thanksgiving. On the one hand, it’s essentially a big dinner with all your loved ones, where hopefully everyone contributes aka my favorite thing. Yet, it’s also completely baseless. We all acknowledge that the supposed foundation of Thanksgiving is completely false, fucked up, and everything in between. So I deal with Thanksgiving, shall we say, tentatively. Which I guess means I’ve missed out on a lot of Thanksgiving movies. 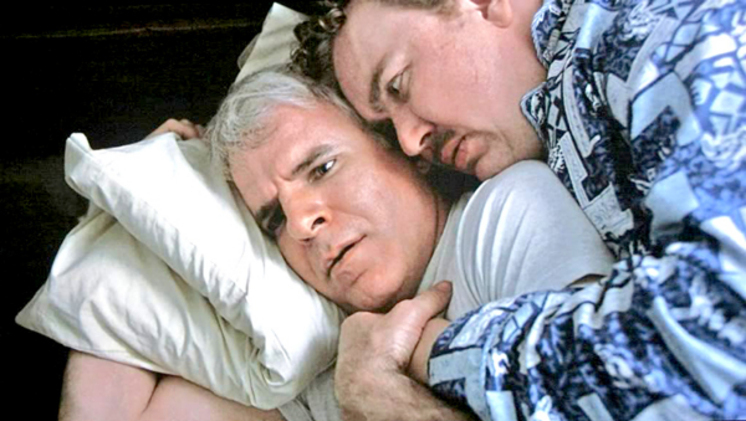 Two nights ago my partner showed me Planes, Trains, and Automobiles, apparently a classic, but one I honestly get confused with Airplane like, all the time. For those who don’t know (ha, yeah right) , P, T, and A, as I will hereby abbreviate, is the John Hughes film about Neal Page (Steve Martin), an uptight, unpleasant Marketing Executive trying to make his way home to his family for Thanksgiving. It’s a series of unfortunate events from there on out. A cab is stolen from him by Del Griffith (John Candy), a chatty and slightly socially clueless shower-curtain salesman (I think? ), who continues to be across the board stressful. The classic setup for an odd couple. If you are prone to anxiety, this movie is not for you. Don’t get me wrong, I succumbed to its charms, particularly Candy’s, but I was watching through spread fingers. Half of me was saying, “oh my god, Steve Martin needs to chill out. He is the least fun dude ever. He doesn’t even deserve his family!” and the other was hyperventilating because logistical stresses are just the straight up worst. But I sort of got it, y’know? I mean I can’t imagine it’s the movie I’ll pass down to the next generation but it’s enjoyable. I’m not ruing the 24 years I’ve spent without it, but you get the idea. There’s also something novel about watching a movie that deals with so many logistical problems in an age where we’re so used to things functioning/getting our way. Even though Neal has several options for getting home, the whole process seems so slow and fragile. All it takes is travel to make the world seem like it’s ending. And it does: it’s just this hyperbolic form of this hysteria we all feel, no matter what kind of travel we’re dealing with, about getting home to your loved ones. So if you’re traveling this holiday season, I hope it works out for you. But if not, you can go home to Steve Martin and John Candy and commiserate.